Adding a 24 oz. bag of Peterson Gas Logs Vermiculite Granules to your Peterson gas log setup is the perfect way to finish off an already wonderful product. Vermiculite granules add a clean, finished look to the fireplace that enhance the beauty of the gas log set and add a unique element to the existing masonry.Please Note* This product is for use only with vented Peterson Flame Pan and Glowing Ember gas burners. How do I correctly place the vermiculite? What about the glowing embers? 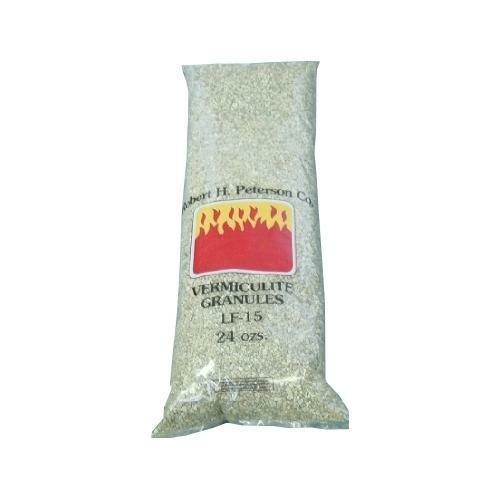 Vermiculite is designed to be a burner medium for propane fueled burner pans. Vermiculite should completely fill the burner pan - level to the top. Ember Glow is then scattered on top of the vermiculite to produce the glowing effect.